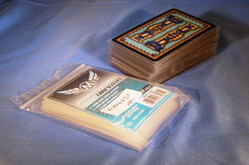 Please note this is a 50 pack of PREMIUM THICKNESS card sleeves that are deluxe plastic sleeves to protect your cards from wear and tear, bending and more! If you play very many European Board Games you probably spend HUNDREDS and HUNDREDS of dollars on your games. What happens to the best ones? They eventually wear out from hours and hours of fun! Don't let your cards get beat up, spilled on, marked up or destroyed by thoughtless friends or family, invest a few bucks in these and protect your investment!